This week, they’re looking at the environmental impacts of foods we eat, and others that we should. They’ll speak to Daniella Martin, host of the insect cooking/travel show “Girl Meets Bug,” about her book “Edible: An Adventure into the World of Eating Insects and the Last Great Hope to Save the Planet.” And they’ll talk about the environmental effects of salmon farming with Peter Bridson, Aquaculture Research Manager for the Seafood Watch program at the Monterey Bay Aquarium (which has appeared in Eva Amsen’s Have Science Will Travel series). 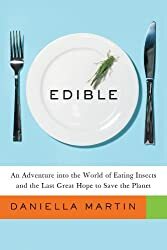 This entry was posted in Curiosities of Nature, Follies of the Human Condition and tagged Daniella Martin, Edible, Girl Meets Bug, insects, Monterey Bay Aquarium, Peter Bridson, Podcast, science for the people. Bookmark the permalink.